Lisa/S is a very small general purpose autopilot. The main goal of creating an autopilot of minimal size and weight, while providing enough functionality to enable fully autonomous operation. Switching buck/boost converter allowing wide range of power input making it perfect and stable for operation from a 1S LiPO cell. 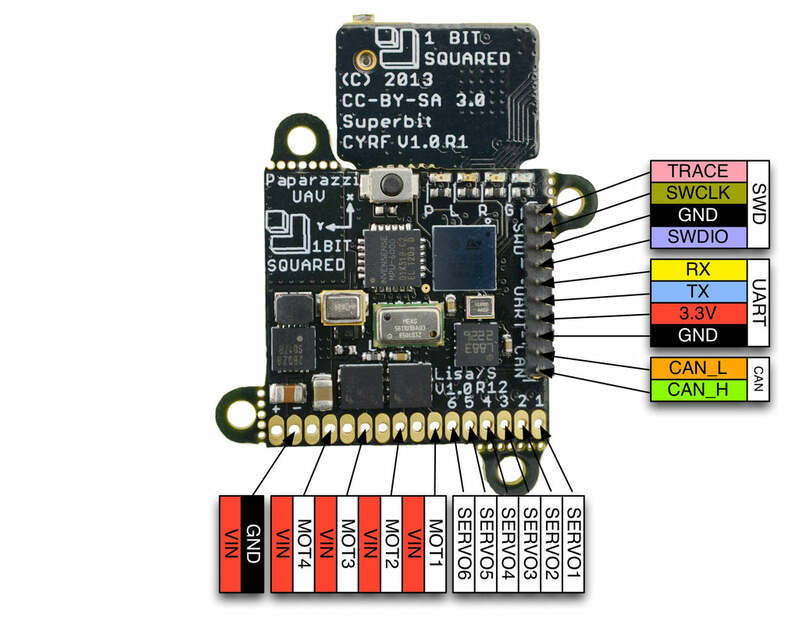 The Lisa/S Autopilot is available for purchase from 1 BIT SQUARED. Once that line is added to the airframe file, you should be able to get the values of the barometer and paparazzi is going to take them into account when doing it's calculations. Warning : the barometer doesn't seams to be working at a higher frequency than 120Hz in a fixed wing airframe. Than mean that in a fixed wing airframe the PERIODIC_FREQUENCY must be equal or lower than 120. In rotorcraft the barometer works fine. The SWIO and GND pin from the Serial Wire Debug (SWD) headers are flipped, such that the order becomes TRACE-SWCLK-SWDIO-GND. There is no capacitor to enable a warm start for the GPS. Instead of four, only two brushed motors can be connected. 1. Go the the Lisa/S Nano Quadcopter Kit Assembly Tutorial Page to get a good explanation for how to connect your board to a Nano Quadcopter. This page was last modified on 28 November 2017, at 03:24.